Published in spring 2017 by Scottish Faiths Action for Refugees, our booklet is now available for free download. Includes facts and figures, definitions, current issues and ideas for practical action by faith communities in Scotland. We have a limited number of printed copies; if you would like a paper version please contact us (information at the bottom of the page). Or read it online by downloading this PDF [2.3MB]. Download this interactive workshop which illustrates the difficult process people must go through when seeking sanctuary in the UK. Using stories based on real people and events, it enables participants to discover the facts in a way which encourages them to engage with the information and empathise with those involved. The stories are drawn from the Independent Asylum Commission hearings. they have been selected to represent a balance of backgrounds, nationality and gender, and their outcome reflects the overall success rate of those who seek sanctuary in the UK. The workshop pack is easy to use, can be adapted to accommodate large or small groups and is suitable for all ages from young adults upwards. An informative, thought-provoking activity which promotes lively discussion. Interested? Download here, or order a pack and for more information please contact Pol Yates or Kate O’Brien. A publicity flyer for the workshop is here. Right to Remain have launched a brand new and unique guide to the UK’s Asylum and Immigration System. The toolkit gives an overview of the legal system and procedures, with detailed information on rights and options at key stages. It also includes actions someone seeking the right to remain can take in support of their claim, or that friends, supporters and communities can take to help someone else. For news follow Right to Remain’s news blog and legal updates blog, which features accessible information written for non-lawyers. 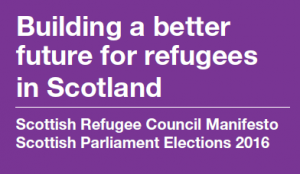 The toolkit was produced by COSLA Strategic Migration Partnership (CSMP) who aim to ensure that Scotland is a welcoming place for new migrants, refugees and asylum seekers. They work with local authorities and their partners across Scotland to support and maintain cohesive and inclusive communities. This toolkit is designed to help think about how to welcome, integrate and involve migrant and refugee communities in Scotland. Learning to live in a new country can be difficult. Welcome to Scotland: A Guide to Scots Law can help individuals new to Scotland understand the everyday rules and laws that will affect them in their new home. The guide is available in 10 different languages. This is a collaborative project with HND Legal Services students from New College Lanarkshire, Crown Office and Procurator Fiscal Service and Police Scotland. The Refugee Women’s Strategy Group are a group of refugee and asylum seeking women, supported by Scottish Refugee Council and funded by Comic Relief, whose aim is to ensure that the voices of refugee women in Scotland are heard. They work to represent the views of refugee and asylum seeking women to key decision-makers and service providers, in order to influence the policy and practices that affect their lives. They have produced a leaflet Claiming Asylum: What Women Need to Know. This provides guidance for asylum seeking women on their rights during their screening interview and substantive interview. The Scottish Refugee Council is calling on politicians to build a better future for refugees in Scotland. Their newly published manifesto sets out five recommendations for the new Scottish Government to be elected in May 2016. If you are looking for a project in your local area, this is a good place to start.